We’ve all heard about the magic “window of opportunity” that occurs post-workout. This period directly following a workout where optimal nutrition is paramount. By getting the right macros, you will assist in faster recovery, decrease muscle soreness and improve body composition. For the hour following your workout, the body is primed for building muscle. Ignore your post workout nutrition, and you can counteract your hard work and effort in the gym. No Bueno. 1. Rehydrate. Water is the most crucial nutrient. It seems intuitive, but many people forget that this is just as important as the rest of your nutrition regime. Don’t forget this post-workout necessity, after getting in a good sweat. Your brain alone is 95% water, but if that isn’t reason enough, staying hydrated also boasts these benefits; reduces fatigue, aids in weight loss, reduces fluid retention, helps build muscle, increases muscle tone and reduces the risk of disease. If you’re one of those people that can’t seem to get enough water, take a water bottle with you during the day and try flavoring it with cucumber or lemon. An adequate amount of protein post-workout can increase muscle building drastically (up to 3-5x!). Proteins are made up of building blocks called amino acids. Amino acids can assist in stimulating protein synthesis (which means muscle growth) for up to 24 hours after your workout. 3. Research suggests 20g of liquid protein. Liquid protein is referring to your whey isolate or whey concentrate shake. Whey is ideal post-workout because it has an excellent amino matrix and digests and is absorbed quickly. The most common complaint I hear here is that a “whey concentrate upsets my stomach.” Finding a high-quality isolate (which is virtually lactose-free) may alleviate this problem. Similarly, if you have dietary restrictions and cannot consume dairy or milk products an alternative is rice or pea protein. 4. Replenish your glycogen stores with carbohydrates. After a hard workout, your muscles are depleted of glycogen which needs to be replaced, so you have the energy to make it through your next upcoming workout. If fat loss is your primary goal, you’ve likely heard that you should stay away from carbohydrates and that only protein is needed post-workout. While carbohydrates don’t increase protein synthesis – they do assist in preventing protein breakdown. Now before you say “but muscle growth isn’t my goal,” at the very least you want to maintain the muscle mass you currently have which means remaining in a positive net protein synthesis state. Your metabolism is primarily determined by the amount of lean body mass you have. Fat mass doesn’t require energy and therefore does not burn calories as lean skeletal muscle does. If your goal is to lose fat mass, you will still see the biggest overall effect if you target both (increasing protein synthesis and decreasing protein breakdown) at the same time instead of favoring one over the other. 5. Use the 2:1 carbohydrate-protein ratio for intense workouts. This magic ratio has been shown to enhance muscle building and reduced recovery time if you’re training for periods longer than 60 minutes and with intensity. These high-intensity endurance workouts leave the body depleted of carbohydrates, and glycogen stores need to be replenished post workout so you can make it through your next workout. This ratio would translate to 1.2-1.5g/kg of simple carbohydrates and 0.3-0.5g/kg of quality protein. 6. Macronutrients are essential; micronutrients are equally so. For those of you who are familiar with “if it fits your macros,” macro counting/tracking will likely already know this. The quality of your food matters. Simple carbohydrates are those found in foods such as fruit or dextrose containing foods like honey; they are also found in processed food such as cookies, cakes, and other sugary snacks containing sucrose. Yes, you can get 25 grams of carbohydrates from fruit, or 25 grams of carbohydrates from cookies. However, the benefit of eating a fruit that contains fiber, vitamins, and minerals is far better than opting for an “empty” carbohydrate that provides minimal nutritional benefit outside of “fitting” within your macro parameters. Take home message: Get your nutrients from whole, unprocessed foods as much as possible. 7. 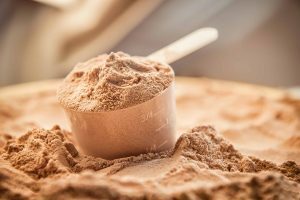 Watch the labels of your post-workout protein powders. Paying attention to what you eat post-workout can help you in more ways than just building muscle mass or reducing fat mass. Good post-workout nutrition can improve recovery, reduce muscle soreness, increase protein synthesis and improve immune function. It can also improve bone mass, reduce health disease risk and improve the body’s ability to utilize body fat. Choose high-quality foods and protein powders that are free of added sugars (especially fructose), dyes, or chemicals that are more trouble than they are worth is an important part of maximizing your efforts and recovery.